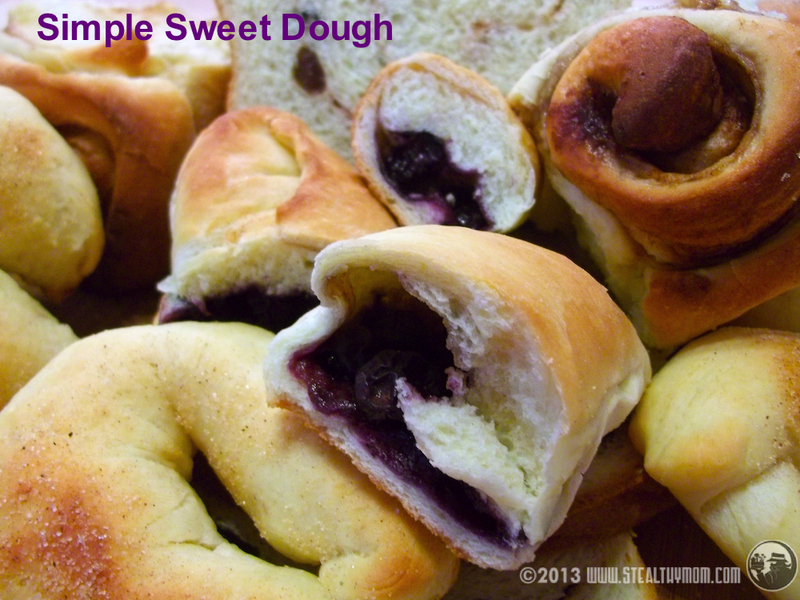 A basic sweet dough can make so many things. Last week the boys and I made a double batch and baked up cinnamon rolls, butter doughnuts, sticky buns, kolachi, and raisin bread. The same dough can be used for bierocks, fancy breads, and stuffed with potatoes and cheese for tiny pyrizhky. We are planning on holding a bake sale for No Kid Hungry, so this was "practice." Sweet dough is one of the easiest yeast doughs to make by hand. My greatest challenge is to just let go and use white flour. Trial after trial, using various ratios of whole wheat-to-white, I find that the fluffiest, most tender pastries need the fine texture of white flour. Once the aroma of cinnamon buns in the oven takes over the kitchen, I can get over the health kick. * Avoid the urge to knead in too much flour. Your dough will be really soft, and that's okay. There will be eggs to add some lift. * Use fresh eggs. Can you get them from your backyard or right from someone else's? Use those. * Butter. Butter, butter. Butter in the dough, melted butter in the rising bowl and on top. Melted butter in the pan.... Margarine is not butter. If you are dairy-free, the only thing I have found to come close is pure coconut oil, and for that add a pinch of salt. * Avoid instant yeast. It doubles too quickly, not leaving enough time for the flour to stretch and soften. * If it is really warm in the house or you need the first rising to take longer so you can run errands, use half the yeast. That will buy you twenty minutes. * After forming the pastries, let then rise until they seem almost frothy. Unlike regular bread, there is little risk of a collapse from too much rising because there are eggs in the dough. * To make dough the night before for breakfast, pop it straight into the fridge before rising. In the morning, give it a light knead to break carbon dioxide bubbles, and give it extra time to warm up and rise after the pastries are formed. You can make the pastries ahead and refrigerate them to slow the rising. Allow them extra time, at least half an hour, to warm up before you bake them. This is my favourite basic sweet dough recipe, adapted from the Five Roses: A Guide to Good Cooking book. In my well-worn copy, printed in 1983, it's on page 25. Dissolve the two teaspoons of sugar and yeast in the warm water. Meanwhile, scald the milk, either in the microwave or on the stove, then add the half-cup of sugar and the butter and salt. The butter will melt and cool the milk down. When the milk mixture is warm, not hot, stir in the yeast mixture. Whisk the eggs until fluffy in a bowl, then stir them in as well. Stir in five cups of the flour. When you have a dough that does not stick (much) to the bowl, turn it out onto a floured board and knead in enough of the remaining flour, a quarter cup at a time, to make a soft dough. Grease a large, clean bowl with a couple tablespoons of soft butter. Put the dough ball in the bowl, spin it around to coat it with butter, and flip it buttered-side-up in the bowl. Cover with a clean cloth, and leave it to rise until doubled, about an hour and a half. When an imprint of your finger stays in the dough when you gently poke it, it has risen enough for this step. Divide the dough into three or four parts. (Three for loaves, four for rolls.) Form the rolls or loaves, and place them in buttered baking dishes to rise until doubled, about an hour before baking. If you make a double-batch, you can punch down half of it and wait half an hour before forming. Bake at 375F for 12 to 20 minutes, depending on the size and shape. Roll out a quarter of the dough to a rectangle, about 12" by 16" Generously brush with melted butter (about 1/4 cup), a quarter cup of brown sugar or sucanat, and a heavy-handed sprinkle of cinnamon, about 1/2 a teaspoon. Roll it up like a jelly roll, rolling up the shorter length, leaving a longer roll. Pinch the edge, sealing the roll. Slice into eight rolls, and arrange them, touching, in a buttered, 12x12 pyrex pan. Cover with a clean cloth and let rise until doubled, about an hour, and bake for 17-20 minutes. Prepare rolls like for Cinnamon Rolls, but use a heavier coating of butter, and double the brown sugar to a half packed cup. Cover with a clean cloth and let it rise until doubled, about an hour, then bake for 17-20 minutes at 375F. The caramel will form at the bottom of the dish, so flip them over and cool a bit before serving. Roll out a third of the dough into a rectangle, about 12" by 24". Gently brush with melted butter and sprinkle with cinnamon. Sprinkle a generous cup of soft raisons over top, as evenly as possible. Roll up the dough along the shorter length, leaving a 12" roll. Pinch the edges and ends, and place the loaf into a buttered pyrex loaf pan. Brush the top with melted butter, cover with a clean cloth and allow it to rise until doubled, about an hour. Bake for 20-24 minutes at 375F, until it sounds hollow when you tap it on the bottom. Roll out a quarter of the dough to about a half-inch thick. Slice into a dozen squares. To each square, add about half a dozen blueberries and a pinch of brown sugar or sucanat. Fold over and seal the edges, making a small bun. Place on a buttered baking dish, with at least an inch between. Brush the top with melted butter, and allow to rise until doubled, about an hour. Bake for 12 minutes at 375F. Kolachi freeze well, so consider making a whole batch at a time. You can fill them with jam, too. Get out the largest pyrex baking dish you have, or use two. Generously butter the bottom and sides of the pan. Instead of frying, these doughnuts will be baking in butter. Yum! Take a quarter of the batch (or more if there are people around who will eat them as soon as they are out of the oven.) Roll the dough on the table, between your hands to make a three-foot rope. Cut into a dozen pieces. Pinch the ends of each piece together to form a loop, then arrange them in the baking dish. Generously brush with melted butter. Allow them to rise until doubled, about an hour, then bake for 12 minutes at 375F. Brush again with melted butter as soon as they come out of the oven. Our bake sale is finally going to happen this week! Part of me secretly hopes it will rain, no one will come and I'll have to gobble up the goodies by myself. :) Well, not really. One in five kids in America don't get enough to eat. The No Kid Hungry programs help summer lunch programs and to teach lower income families how to cook with less. If we sell out, we can always bake more. I shared this post with Thriving on Thursdays. Thank you so much for the recipe and the great tips! I bet your kitchen smelled heavenly while you were baking this. Pinning!